Living well with asthma – What’s functional and dysfunctional breathing got to do with it? Asthma affects 1 in 10 people in Australia, that’s about 2 million people and about 655 million dollars is spent on asthma every year according to the Australian Bureau of Statistics. What these figures don’t show is that asthma has very different effects on people’s lives. Some asthmatics live well with their asthma, stick to their written asthma plan and manage to have a good quality of life despite having asthma. However many people with asthma do not have good control of their asthma either because they don’t regularly take their asthma medications or because they don’t respond well enough to their medication to live without the suffering of unwelcomed breathlessness, stress, fatigue and reduced physical capacity. A survey conducted in 2008 of 5 European countries showed that this was the case for over 50% of asthmatics  and the figures are likely to be similar for Australia. One of the interesting facts about asthma is that breathlessness and other symptoms do not necessarily correlate with how well people score on lung function tests. Some people with mild asthma suffer more than people with more severe asthma. The reasons for this are complex but presence of dysfunctional breathing is one important factor known to increase symptoms and reduce quality of life in asthmatics. Symptoms that arise from dysfunctional breathing do not respond to asthma medication because they are not part of asthma, they are due to dysfunctional breathing. Other symptoms, including certain types of breathlessness are produced by asthma but aggravated by dysfunctional breathing. Some aspects of dysfunctional breathing can also aggravate the pathological lung tissue changes that characterize the disease asthma, making the airways more inflamed and susceptible to spasm in response to triggers. Dysfunctional breathing in asthma – it’s common and multidimensional. Research has shown that about 30% of asthmatics  and over 65% of asthmatics with problem or poorly controlled asthma have dysfunctional breathing. These dimensions are linked but do not necessarily always co-exist. Each dimension on its own can contribute to asthma symptoms, reduce asthma control and affect health and quality of life . Hyperventilation makes bronchi more likely to constrict, nerves become more twitchy and the bronchi themselves are more likely to become reactive to asthma triggers . Hyperventilation leads to symptoms like numbness, tingling, dizziness and mental confusion and even anxiety and panic that are not directly related to asthma and so do not respond to asthma medication . People with chronic hyperventilation develop a lower set point to CO2 and while most people want to slow down or stop their breathing when CO2 levels are critically low, chronic hyperventilators will be induced to hyperventilate even more creating viscious cycles that keep breathing out of control . Breathing pattern disorders include high thoracic or chest breathing, paradoxical breathing where the rib cage and abdomen narrow during inhalation instead of widening and excessively erratic and irregular breathing with lots of sighing. The presence of these types of breathing pattern disorders in asthma sufferers is often associated with both tension/hypertonicity and weakness of key respiratory muscles such as the diaphragm. Tension and weakness can sometimes co-exist because muscles that are shortened due to tension are also weak. In any case tense, weak and poorly co-ordinated breathing muscles do not respond well to voluntary and involuntary breathing efforts. This contributes to breathlessness and respiratory discomfort . Very often people with neuromuscular dysfunctions of respiratory muscles will complain that they cant take a satisfying breathing or that their rib cage is tight and cant expand. When symptoms of respiratory discomfort are coming from the chest wall and the respiratory muscles rather than the bronchi, they are not responsive to asthma medication. This fact and the feeling that breathing muscles are not responding as expected to breathing efforts can a person feel that their asthma is out of their control. Stress anxiety and conditions such as panic disorder are about 4x higher in people with asthma[11,12]. Also people with asthma are highly susceptible to the effects of stress on their breathing and on their perception of breathlessness. Asthma suffers who are anxious and tense can become conditioned to have unusual breathing patterns and they also experience more breathlessness. Many decades of research has shown that one’s sense of being in control is very important for health . Low sense of control increases fear and anxiety which can, amongst other things lead to more asthma symptoms. Presence of hyperventilation and breathing pattern dysfunctions both reduce sense of control in asthma because they produce symptoms that don’t respond well to medication and also because they disrupt the mechanisms and pathways that regulate breathing. Learning to take control of symptoms by correctly modifying your breathing is an important step for increasing your sense of control. Breathing retraining, relaxation and manual therapy can improve dysfunctional breathing. Research has shown that after breathing training asthmatics often have less symptoms, less medication and better quality of life [14-16]. At present the British Thoracic Society gives a Level A rating for the evidence on breathing therapy and recommends that it be used in addition to standard medical care. The Australian Asthma Council which gave a Level 2+ rating for effectiveness of breathing therapy in 2006, has been less encouraging in recent years. In their 2014 handbook they report that the results of research are inconclusive but that breathing therapy is probably effective. What were the reasons for the decrease in ratings between 2006 and 2014, what changed? Between 2006 and 2014 there was a significant increase in the number of research studies on breathing training and asthma, investigating approaches such as the Buteyko method, physiotherapist led breathing retraining, biofeedback, inspiratory muscle training and pranayama. Most of these showed positive results in some aspect of a whole range of variables including medication needs, asthma symptoms, quality of life, anxiety and depression, airway resistance, lung function measures such as FEV1, PEF, FEV1/FVC and MVV. However, the systematic review reference by the Australian Asthma Council in their report stated that while breathing training had benefits that should not be dismissed, the increased number of the large number of differences in breathing techniques, treatment rationales, intensity and duration of treatment and patient selection made the data difficult to interpret. One of the key conclusions of a large study by the American Agency for Healthcare Research and Quality  investigating comparative effectiveness of breathing exercises and/or retraining techniques in the treatment of asthma was that to be effective treatment has to be targeted to the patient and of sufficient intensity and duration. Integrative breathing therapy is a comprehensive approach to breathing retraining that considers the 3 key dimensions of dysfunctional breathing, the biochemical, biomechanical and psychophysiological. Treatment begins with a thorough assessment for presence of acute or chronic hyperventilation, breathing pattern disorders, poor breathing habits and stress related breathing issues. After breathing assessment patients are taught a range of breathing techniques that are modified as necessary to ensure that all key aspects of breathing functionality are optimised. 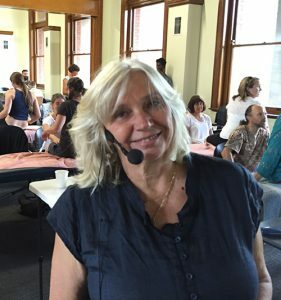 Integrative Breathing Therapy is available in individual sessions and after initial assessment you can also complete the IBT program in a small group class. Demoley, P., et al., Update of asthma control in 5 European countries. European Respiratory Review, 2010. 19: p. 150-157. Teeter, J.G. and E.R. Bleeker, Relationship between ariway obstruction and respiratory symptoms in adult asthmatics. Chest, 1998. 113: p. 272-277. Thomas, M., et al., Prevalence of dysfunctional breathing in patients treated for asthma in primary care: cross sectional survey. BMJ, 2001. 322: p. 1098-1100. Stanton, A.E., et al., An observational investigation of dysfunctional breathing and breathing control therapy in a problem asthma clinic. J Asthma, 2008. 45(9): p. 758-65. Courtney, R., Dysfunctional Breathing: Its Parameters, Measurement and Clinical Relevance, in School Health Sciences. 2011, RMIT: Melbourne. p. 317. Courtney, R., K. Greenwood, and M. Cohen, Relationships between measures of dysfunctional breathing in a population with concerns about their breathing. Journal of Bodywork and Movement Therapies, 2011. 15(1): p. 24-34. Sterling, G.M., The mechanism of bronchoconstriction due to hypocapnia in man. Clin. Sci., 1968. 34: p. 277-285. Ritz, T., et al., Hyperventilation symptoms are linked to a lower perceived health in asthma patients. Ann Behav Med, 2008. 35(1): p. 97-104. Folgering, H. and P. Colla, Some anomalies in the control of PACO2 in patients with a hyperventilation syndrome. Bull. Europ. Physiopath. Resp., 1978. 14: p. 503-512. Lougheed, M.D., Variability in asthma: symptom perception, care and outcomes. Can J Physiol Pharmacol., 2007. 85(1): p. 149-54. Ritz, T., A.E. Meuret, and A.F. Trueba, Psychosocial factors and behavioral medicine interventions in asthma. Journal of Consulting and Clinical Psychology, 2013. 81(2): p. 231-250. Lehrer, P., et al., Psychological aspects of asthma. Journal of Consulting and Clinical Psychology, 2002. 70(3): p. 691-711. Seeman, M. and T.E. Seeman, Health behavior and personal autonomy: A longitudinal study of the sense of control in illness. Journal of Health and Social Behavior, 1983: p. 144-160. Grammatopoulou, E.P., et al., The Effect of Physiotherapy-Based Breathing Retraining on Asthma Control. Journal of Asthma, 2011. 48(6): p. 593-601.